Soon afterwards a lone loon flew by- photos aren't great but I think it's the first time I've seen one in flight. For shorebirds I only found four Sanderlings, but it was still a nice long walk along the beach. Can't go wrong with pelicans, right? The grasses between the beach and the parking area were jam-packed with Savannah Sparrows. I failed to find the longspur that's been seen, but that's okay. Along the beach were more Sanderlings and a small collection of mostly California Gulls and one lone Caspian Tern. The only one I saw all day. The last birdy stop we made (after uneventful stops in Hammond and the Elmer Feldenheimer Forest Reserve) was at Seaside Cove. Here I found the usual gulls including a bunch of Heermann's Gulls. As you can see, the gulls were mingling with some Black Turnstones, who in turn were mingling with a couple of Surfbirds! A truly awesome day at the coast with temps in the 60's and tons of birds! Good times! Looks like a really nice trip- and such beautiful weather! Hi Jen, looks like a great outing. Love the flight shots and congrats on your lifer. The Nuthatch is one of my favorites, they are so cute. Great post! Sweet diversity! It's like a united birds of benneton advert. 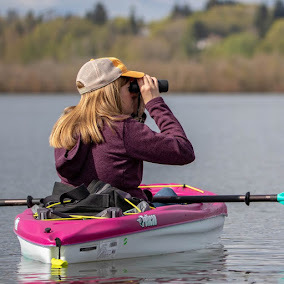 From your photos and descriptions, this seems like a truly excellent spot, capable of drawing in just about any and all of the birds that can be seen elsewhere in the state. Looks like you had a wonderful trip and got some very successful photos. You have really learned to love birds. Great birds on this trip Jen...I love the shore birds and the Baird's is quite a nice Lifer for sure! Congrats on that one. Also Nice to see that loon in flight photo..that is rare to catch! Baird's juveniles? Nice! Congrats on the lifer! Thanks! I was super psyched that I ID'd them all by myself..